For as long as I can remember, I’ve really loved magnets. They’re so cool in the way they snap together. It is even cooler when they push each other apart. Just looking at one you don’t know which it will do. They’re almost magical. Dad found a game at Goodwill this Spring that used magnets in a version of tic-tac-toe. As you moved your pieces over them, they flipped colors! And last year I spotted Jishaku at the same store. 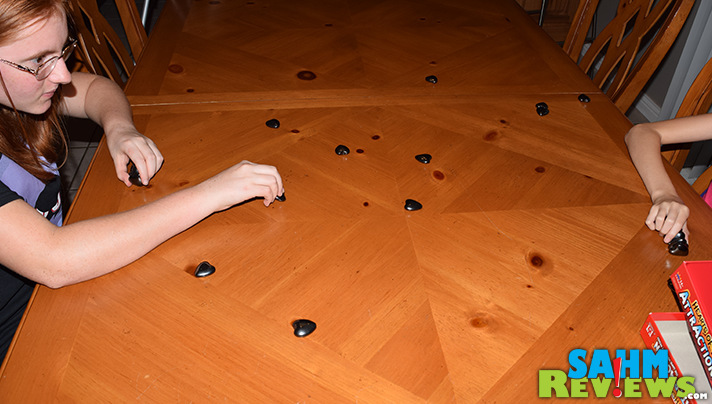 In this game you tried to place as many magnetic pieces as you can without having them connect. 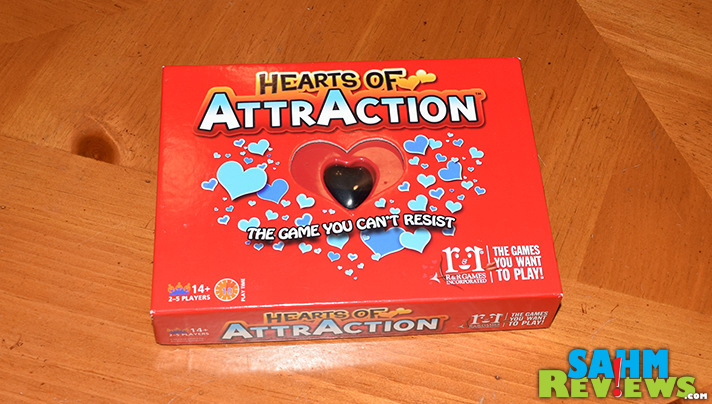 But when I saw Hearts of Attraction from R&R Games at the Origins Game Fair, I knew it was one I must have. All you need to play (besides the game) is a large, smooth surface. Hearts of Attraction includes 25 heart-shaped magnets and a handy bag for taking it on the go. Unlike Jishaku, in this game your goal is to make them connect. The more you connect, the more points you score. Each player takes turns shooting one of the hearts across the table trying to get it to connect to as many other hearts as they can. It sounds easy, but it really isn’t. You don’t know which side is positive and which is negative, so the one you shoot at may push it away instead of attracting it. It also takes some skill to get them to stick together due to the funny shape of each heart. I found that you need to have a little wobble in your throw or else they’ll just bounce off each other. Let me show you exactly how this works! 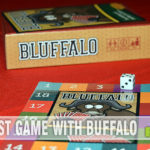 We’ve been taking Hearts of Attraction to our local game night and have had a lot of fun with players of all ages. It is definitely a game where age doesn’t matter and one where practice will make you better. It’s a little under $20 on Amazon and I think would be a perfect gift for anyone as young as 8 to as old as my dad (maybe a little older too!). I love the games that R&R Games makes and haven’t found one I didn’t like. My favorite is still Hanabi, but this one is a very close second! Check out their website and follow them on Twitter and Facebook so you can see all of their stuff too! 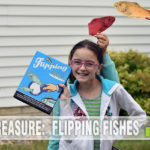 You can also enter to win a copy! Do you think you’d be any good at this game? I wanted to check this game out…..
Fridge magnets of course! Looks like fun, o plus you can just store it on your refrigerator. This is very neat! Looks like something I would enjoy. Thank you for the contest. This game sounds like a lot of fun. I enjoyed playing with Legos and magnets, making my creations pick things up. My favorite use for a magnet is to put one on the back of a clear glass coin/rock containing a cute picture to make a nice refrigerator decoration. 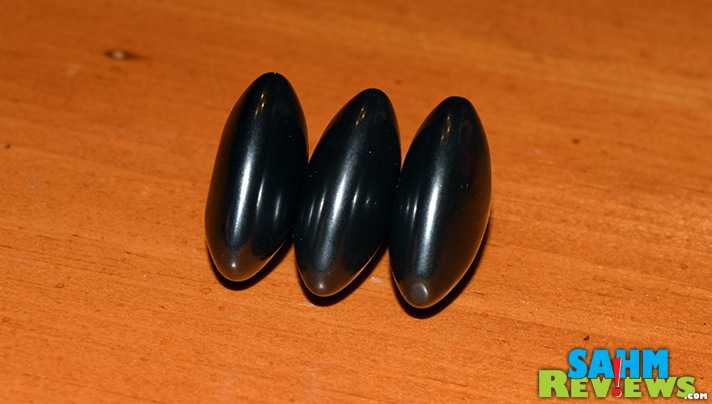 Magic – There are some cool tricks that use magnets. My favorite use for a magnets are to keep kids drawings and other papers on the fridge. It’s a great way to show off their hard work, creativity, and achievements. We also like to use letter magnets. My toddler loves learning letters and my 11 year old likes using them to make words and come up with silly sentences. My favorite use for magnets is holding stuff onto the fridge (now that we got a new fridge and its back to being magnetic again – stupid “real” stainless steel non-magnetic shenanigans). 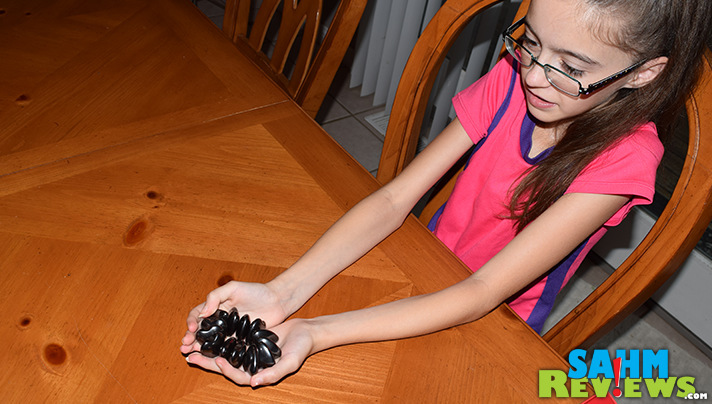 Magnet games are great! Pull one out while you are talking to someone and you can pretty much teach it without pausing the conversation. My sons had a pair of these magnets and I have only one. It is on the refrigerator, but they played with these magnet forever.